Because One Person Demanded It! Author PhillipPosted on July 12, 2011 Categories ToysTags Star Saber, TransformersLeave a comment on Because One Person Demanded It! I spent the weekend visiting Pasadena, and the official Transformers convention – Botcon! My feet were dead by Friday night, but that didn’t stop me from having a great time. Met some new friends, saw some great costumes, and added more signatures to my G.I. Joe dvd set. I also bought a few fun things, one of which is six inches from me, resting on the desk. It’s a Star Saber! Such an awesome toy! Now I’m sorting through pictures online to see if I can see myself or my girlfriend in the background. You’d be surprised how often it’s happened so far! Author PhillipPosted on June 8, 2011 Categories ConventionsTags Botcon, G.I. Joe, Star Saber, TransformersLeave a comment on Botcon! I have a tank that transforms into a skeletal samurai. He has two swords that can be carried on his waist. And he is a Decepticon named Bludgeon, that references an obscure Transformer from the late 1980s. He’s pretty much perfect. I kind of wish he was a Pretender, though, since that’s what the original figure was. But then nobody remembers Pretenders, and it would confuse all the kiddies wandering the toy aisles at Target. Other than that, he’s fairly awesome. I need someone to do battle with him, sword to sword. I might actually need to get a real Star Saber! Just a warning – if you aren’t a toy geek, this will mean absolutely nothing to you. On Sunday I picked up a bootleg Transformers 2 pack from Tuesday Morning. I got it because it was 5 bucks, and it had a pretty decent looking Star Saber in it. Imagine my annoyance at the fact that due to his bootleg nature, I can’t get him to transform properly. But the other guy from the pack? He transforms just fine! I didn’t even want him. But I just checked. The other guy is a bootleg of Victory Leo. And he can combine with my Star Saber to make Victory Saber! Awesome! 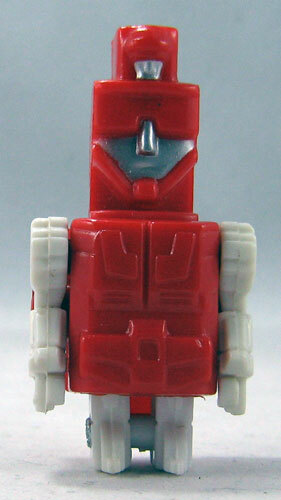 And fortunately, I have another little Star Saber that is actually licensed and capable of transformation. About Me A seldom-updated blurb about who I am. Dio-Stories Stories told through fumetti! G.I. Joe Customs I made custom G.I. Joe toys. Deal with it. G.I. Joe: The Return Old fanfic I wrote back in 2001! Guestbook An old guestbook of mine. Links Old and probably outdated links to other sites.